Tom Woewiyu stands outside the federal courthouse in Philadelphia with his family on July 3, 2018, after he was convicted of hiding past as Liberian war criminal. A Delaware County man accused of hiding his past as a top lieutenant to Liberian warlord Charles Taylor was convicted Tuesday on federal immigration fraud charges — the second historic verdict of its kind in Philadelphia and one that renewed calls for further accountability in the West African nation where war criminals have gone unpunished for decades. 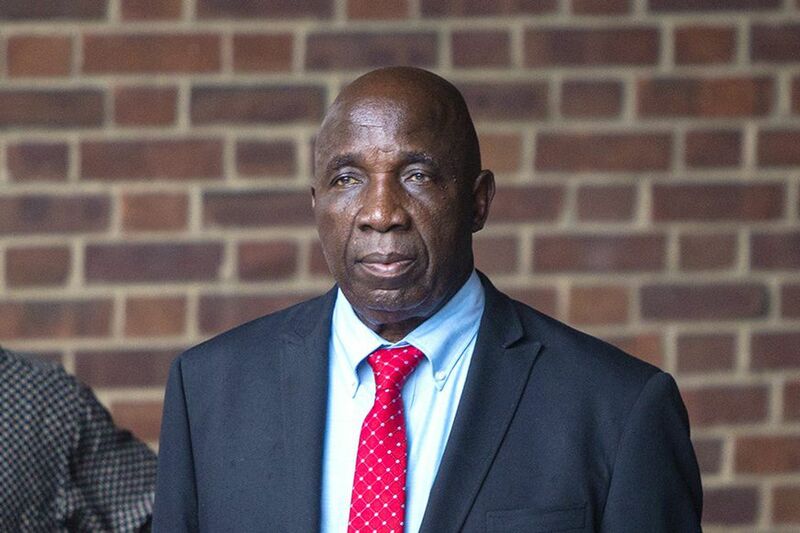 Thomas Woewiyu, a 73-year-old Collingdale grandfather and former spokesperson and defense minister for Taylor's National Patriotic Front of Liberia (NPFL), is the highest-ranking official to be found guilty of crimes tied to the numerous documented atrocities that occurred during Liberia's first civil war — a multifaction conflict that ravaged the country between 1989 and 1997. His conviction comes months after a Liberian expat in East Lansdowne — Mohammed "Jungle Jabbah" Jabateh — was sentenced to 30 years in prison in a similar case tied to misdeeds committed while fighting against Taylor's forces. Neither Woeiwyu nor Jabateh was specifically charged with the acts of torture, ethnically targeted killing, and conscription of child soldiers that government witnesses attributed to them or their fighters. Still, federal prosecutors and human-rights advocates claimed victory in the convictions of both men for lying to U.S. immigration authorities about those misdeeds. "We hope that some of the [victims] find some solace in this," said Assistant U.S. Attorney Linwood C. Wright Jr., who prosecuted the case along with cocounsel Nelson S.T. Thayer Jr. "We hope they understand that there are people who in fact care about their experience and want to see them have justice." Across the Atlantic, Hassan Bility, director of the Monrovia-based nonprofit Global Justice and Research Project, echoed the sentiment. "Never before were the crimes of the NPFL described in such detail in a courtroom," he said. "An important piece of our history was documented during this trial." In keeping with his stoic behavior throughout the three-week trial, Woewiyu sat stone-faced as the jury forewoman read out 11 guilty verdicts to counts including perjury and attempting to fraudulently obtain U.S. citizenship. He was acquitted of five additional counts. Woewiyu declined to comment as he left the courthouse with his family Tuesday. U.S. District Judge Anita Brody ordered him kept under house arrest until his sentencing in October. Thomas Woewiyu leaves the federal courthouse in Philadelphia on Tuesday, July 3, 2018, after his conviction on federal immigration fraud charges. Much of the testimony during the trial came from about a dozen Liberians flown in from Africa to recount their horrific experiences during the war. Some testified they sought to flee the violence, only to be herded through NPFL checkpoints decorated with severed heads and strings of human intestines. Two men described how Taylor's rebels rounded up and murdered nearly every man in their Muslim farming community. And in perhaps the most wrenching testimony of the trial, a former child soldier showed jurors his mutilated hand, damaged eyes, and shrapnel wounds on his shoulders — combat injuries he sustained at age 12 after he was kidnapped and pressed into fighting by men under Woewiyu's command. But unlike Jabateh, who dismissed much of the testimony from his countrymen as lies during his trial in October, Woewiyu rarely questioned the truth of the disturbing wartime accounts related by government witnesses. Instead, his lawyers — Mark Wilson and Catherine C. Henry — questioned what any of it had to do with their client's case. Since his 2014 arrest at Newark International Airport, Woewiyu has maintained that he was unaware of the worst excesses of Taylor's regime and that he always had been open with U.S. authorities about his ties to the NPFL. At the height of the conflict in the 1990s, he had frequent conversations with U.S. State Department officials and discussed his role in depth with FBI agents investigating another Liberian in 2012. Woewiyu's lawyers chalked up his initial failure to mention his prominent position in Taylor's regime on his 2006 application for U.S. citizenship as a mistake. "There was no reason to hide his past," Henry said during her closing arguments to jurors Monday. "It was all over the internet. Everybody knew." Indeed, Woewiyu became for many Liberians one of the most recognizable names during the war, whether as a voice espousing NPFL rhetoric from radio speakers or as a military adviser helping to raise and arm a militia to fight on Taylor's behalf. And although he has primarily lived in the United States as a legal permanent resident since the 1970s, he has held significant positions in the Liberian government over the last three decades. His stature both in his home country and in the Philadelphia area's 15,000-strong Liberian expat community only fueled interest in his case. Newspapers in Monrovia, Liberia's capital, closely covered the trial, granting it a totemic status that extended beyond any specific crimes Woewiyu himself may have committed. More than 200,000 civilians died during the war, but no one has ever been held criminally responsible in Liberia for the documented atrocities committed by factions on all sides. Taylor, who went on to become Liberia's president, was eventually convicted of war crimes by an international court in 2012 — but for actions tied to a civil war in neighboring Sierra Leone. And some former rebel leaders continue to hold positions of power within the government. "Hopefully," Wright, the prosecutor, said Tuesday, "there are people in Liberia today who will see that there is a chance for justice."